Digital dental x-rays: All dental x-rays at Page Dental Arts are taken digitally. Digital X-rays have many advantages over film X-rays. Digital x-rays are taken using our computer and sensors. Digital x-rays are instantly “processed” on the computer and there are no processing chemicals, so in addition to seeing your images much faster, digital x-rays are much “greener” than traditional film. The amount of radiation is also significantly less than traditional dental x-rays. Digital x-ray technology allows us to store your images electronically into your digital file, so they can be accessed quickly by our staff and printed or electronically distributed, if needed by your insurance company or any specialist you may see. A full series of x-rays: A full series of dental x-rays is typically 18-20 images, showing all your teeth and underlying bone structure. 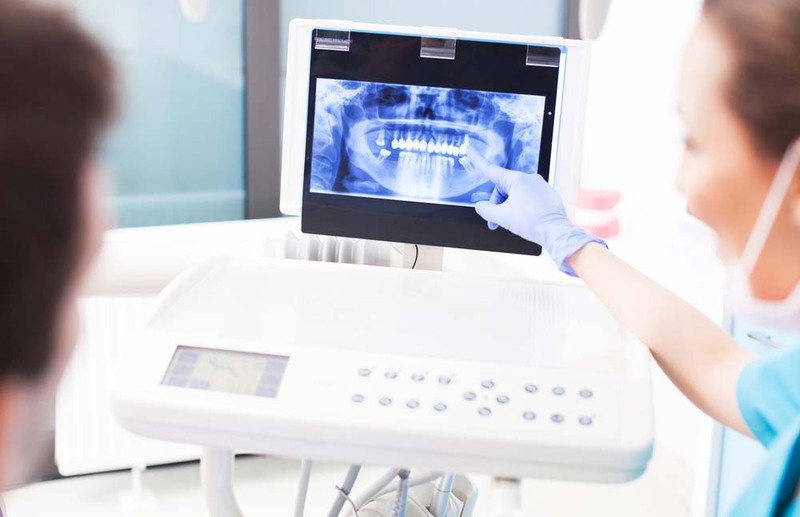 A full series of x-rays is important to not only look for cavities in your teeth, but any infections or abnormalities in the jaw bones as well. At Page Dental Arts, we recommend a full series of x-rays once every three to five years for all of our adult patients. Bitewing x-rays: Bitewing x-rays are typically two to four pictures and are sometimes referred to as “cavity-detecting” x-rays. They help show if there are any cavities forming between your teeth. They also help us evaluate any bone loss around your teeth. We recommend bitewing x-rays at least once a year for all patients, including children. Bitewings may be recommended more often if a patient has an increased risk or history of developing cavities. Periapical x-rays: Periapical X-rays are taken to show the root of a specific tooth. These xrays can help to see cavities in front teeth as well as check for abscesses or infections in a specific area. We may take one or two of these x-rays once a year for front teeth or as needed if a tooth is painful or recently had trauma. We may also periodically use this type of xray to evaluate a dental implant or a tooth that has had a root canal. Panoramic x-rays: A panoramic X-ray is a single x-ray that captures an overall view of your teeth, jaws, and surrounding areas.This x-ray is helpful when looking at the development of the permanent teeth in a child as well as evaluating wisdom teeth in adults. It may also be used when there has been trauma to the face or jaws to look for bone fractures. Additional x-rays: Additional x-rays may be needed in the event of an acute tooth ache or traumatic injury. One or two x-rays may be taken for just a specific area when needed. Also additional types of x-rays may be taken if you visit a dental specialist such as an oral surgeon or an orthodontist.